I’m a longtime listener, first time caller… I think I first found you (and Alpha Mom) in a haze of cloth diapers about four years ago. You’ve been there for me through thick and thin…Ellyn Satter. Potty Training. Secondary infertility and clomid. Now I’m hoping you can help me with my next big dilemma. So the question is: should we tell the kid first? On the one hand, he tends to ruminate on things if he has too much advanced warning, so my husband wants to hold off on telling him as long as possible. But I’m concerned that he might find out accidentally from someone else, and that would stink. To further complicate matters (at least in my mind), I’m also suffering from so much more morning sickness this time around. He knows that something is off, he just doesn’t know what. I’m talking about how my body is just doing a lot of work right now, and that we need to take care of our bodies by getting lots of rest, drinking water, eating healthy foods and getting exercise. He’s been super sweet and snugly and reassuring me that I’ll feel better soon. …but oh yeah, also tell them as soon as you announce it to other people, because you DEFINITELY don’t want them finding out from anyone else but you. I suppose the compromise is to delay telling anyone else right at 13 weeks. That’s not always feasible for every situation (plus at a minimum you’re super excited to make the super exciting announcement by then), but it’s probably worth considering? How far along were you last time before you started to show? You’ll likely show earlier this time, so if you were visibly pregnant by say, 16-18 weeks, that’s not TOO crazy of a delay in announcing to the world. Plus if anyone gets snippy about not being told ASAP!!!!!OMG!!!! you have a very hard-to-argue-with excuse: You needed to tell your son first, and chose to wait until you were showing or had the 20-week ultrasound or whatever. With baby number three, we told our oldest, Noah (then five), around the four-month mark. That was a VERY different conversation, because he was 1) older, and 2) had been to this particular rodeo before. I was showing a little already, plus we were going to see a lot of family over the next few weeks (holidays and such). Again, we had already announced the pregnancy online and to our families, but there was little-to-no-risk of Noah hearing it from anybody else. 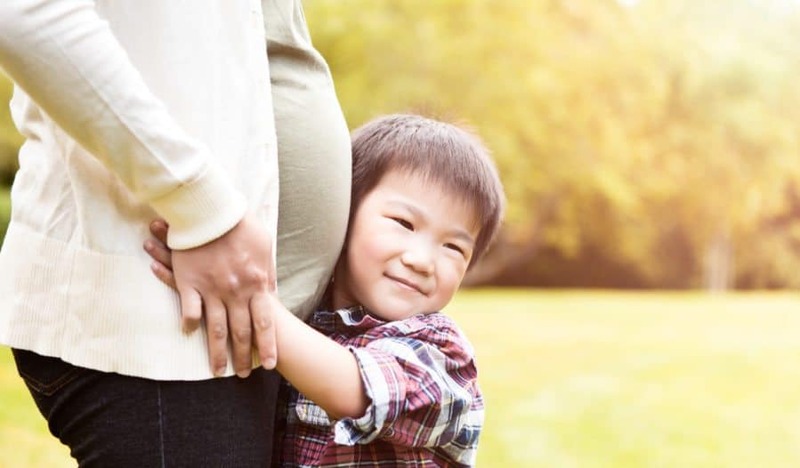 I didn’t tell our neighbors or anyone at his school, for example, until I was UNDENIABLY visibly pregnant (although I believe Noah announced the news himself to his teachers and such, which was fine). So if there’s any way you can restrict your announcement to people who AREN’T going to blab in front of your son (out-of-town/long-distance relatives, your work, friends you trust to be mindful around him), and avoid telling random neighbors or people at his school or daycare, that can buy you some time until you have something a little more “concrete” to offer him. An ultrasound that actually looks like a baby, a visibly pregnant belly, clothes and furniture in the nursery, etc. In the meantime, keep going with the vague explanations you’re giving him right now (your wording is perfect, btw). If that sort of staggered announcement simply isn’t going to work (i.e. your family all lives close by and/or everybody you know is a hopeless blabbermouth), it’s not the end of the world if you tell him sooner rather than later. Just be prepared to not have One Big Conversation about it, but a series of matter-of-fact talks that gradually increase the level of information he needs to process. Encourage him to talk about his feelings and ask questions rather than silently ruminate. And no matter: Read lots of nice bedtime books about babies and siblings (although never at the expense of a familiar favorite) and see if any of his favorite preschool cartoons or characters have a sibling-specific episode or book. Most do, and most of them are really great. Our favorite go-to was Blue’s Clues where Mr. Salt and Mrs. Pepper give birth to Paprika and need to tell Cinnamon the news and WOWOWOWOW I feel like it’s just hitting me how damn weird that was. So hey, if learning about a new baby via condiments didn’t scar my kids for life, you won’t either, no matter how or when you end up telling him. In terms of meet-the-baby media, I highly, HIGHLY recommend Daniel Tiger meeting Baby Margaret. It’s a CBC production and available on YouTube, and was priceless for my then-2.5 year old.